IBM's Jeopardy! star supercomputer Watson has turned its attention from trivial pursuits to even more mundane pursuits – namely, crunching sales figures for companies. Big Blue on Tuesday announced Watson Analytics, its latest attempt to pimp its "cognitive computing" tech as a cloud service, this time aimed at business professionals in such fields as sales, marketing, operations, finance, and human resources. "Watson Analytics is designed to help all business people – from sales reps on the road to company CEOs – see patterns, pursue ideas and improve all types of decisions," Bob Picciano, senior VP of IBM's Information and Analytics group, said in a statement. "We have eliminated the barrier between the answers they seek, the analytics they want and the data in the form they need." Example use cases include exploring sales figures by region and customer age, or figuring out how to retain employees longer by plotting when they leave the company and why, among countless other scenarios. Once their data is loaded into the system, users can ask questions in plain language, such as "what predicts sales?" or "what drives the total amount of purchases made?" Mind you, convincing seasoned business types to set aside their spreadsheets and other traditional data tools could be a tall order. But IBM thinks its combination of an easy-to-use UI, natural language processing, and Watson-powered predictive analytics on the backend could be a better solution for professionals who might otherwise lack the training to do analytics effectively. One trick Big Blue has up its sleeve is that Watson Analytics doesn't just crunch the numbers, but it also guides users through the process of figuring out what data they have that's useful, which IBM says can take up 50 per cent or more of the time in a typical analysis project. "Most analytic offerings assume users have data ready for analysis, a clear idea of the type of analysis needed, and the skills and time to build a model for analysis," IBM says. "However, most business users have none of these things." 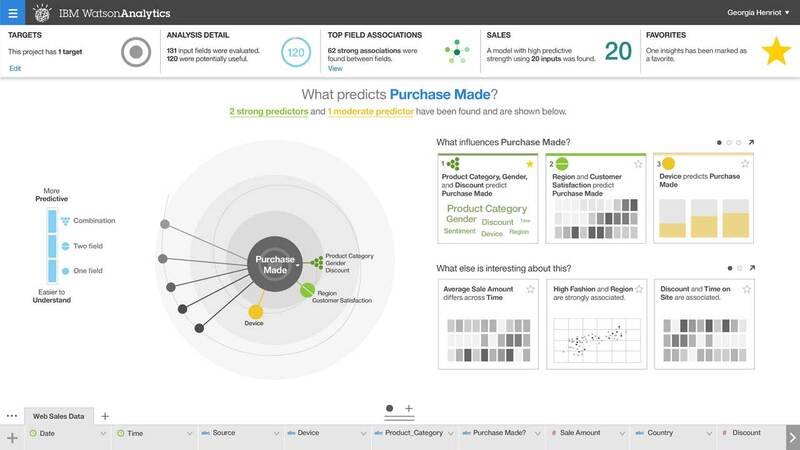 IBM says it plans to offer Watson Analytics in a "freemium" model – meaning you'll be able to access basic features for free but will have to pay for the more advanced stuff.